Ready to sail although could now do with some tlc. Only two owners since 1992 – one careful, one more neglectful in recent years. Two suits of sails, both old but serviceable (one main in need of some repair). Newish cover.Trolley.
" An ideal boat for Redesmere. Lighter and more lively than a GP, more forgiving than some more modern designs." Good condition, comes with launching trolley (new wheels) and road trailer. Also includes spinnaker assembly and sail, currently removed, and mainsail top float. "The Magno is a great family boat, with a deep, spacious hull with the capacity to carry a family of four.Two seats for children are positioned at the front of the cockpit and a fibreglass thwart in the centre together with seating on the side of the boat makes this a really roomy choice for a young family. Add the fact that the Magno is fitted with a gnav system and the size of the cockpit is even further optimised. 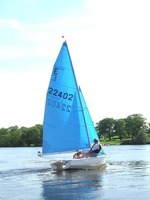 The boom is the right height to clear small children and the lightweight pivoting epoxy centreboard makes for easy, family-friendly sailing. The flotation device, fitted at the head of the sail, removes the risk of total capsize." Complete with XD controls. Refurbishment also included new sail, cover and foil bag. Poor health forces reluctant sail. Due to family commitments, boat has now fallen into disrepair, but is an excellent 'project' candidate. To advertise on the the Club For Sale / Wanted page, please send advert content to the Website Coordinator, including your own contact details. Please advise when items are sold or found, so that adverts can be withdrawn promptly. Adverts will be automatically taken down after 3 months, but can be re-posted on request.